A lot of traders love to trade Futures. Unfortunately most of them play it un-hedged or naked. Futures is highly leveraged derivatives and has a Delta of almost 1. Which means it moves 1 point with every 1 point move in the underlying. Isn’t this trying to take too much of risk? Remember you are leveraging your money. Whatever, if done well, rewards are amazing. Futures can make you a fortune pretty soon or can take away all your wealth within months. Unlike options where the losers bleed slowly, Futures will bring results pretty fast. That is why you will rarely see a Future trader who has lost a fortune. However you will find many option traders who have lost a lot of money in the markets like here and here. Simple reason is that Futures traders lose a lot of money in 1 or 2 months and then they quit. Option buyers on the other hand bleed slowly. They lose small sums which are not painful, then they get their salary and try again  this time for a recovery – lose some more  next month by luck they recover some money. Then brokers tell them to keep trying, and after years and years of trading they find that they are deep in red amounting to lakhs. By this time their brokers are running all the way laughing to their banks and the trader stops trading frustrated promising never to return to the stock markets. Money Lost  acceptable  Time Lost without any meaningful knowledge is not acceptable. But then it gets too late. Sometimes it gets so bad that these people do not even invest in any stock or mutual funds. They only invest in bank FDs. That is where they lose even more. However, there are some who make a lot of money. I was told by a trader who took my course that there are two brothers in some town in Tamil Nadu who are making a killing trading Futures hedged with options. They are making a profit of almost 20-30 lakhs every month on a 1 crore account. Well that works out to a cool 30% return. That does not mean everyone can do it. They must be following a solid strategy and most importantly they are highly disciplined. We will go to the topic soon but before that let me explain how these brother might have reached there. 1. First they got some education on trading. 2. Then they must have tested a few strategies that their system may have provided or they may have developed themselves. 3. These strategies may have been tested on paper or one or two lots max for at least 6 months. 4. 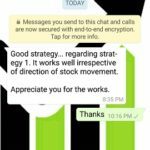 Then once they got a strategy that suits their personality and trading style and also bring in good results  they would have gradually started increasing the lot size of the strategies. Yep some knowledge, some hard work, and some discipline but see if you are highly disciplined and have a sound strategy making a lot of money from stock markets is not that difficult. But you need knowledge, patience and discipline – that’s the key. So why am I telling you all this? Because the strategy we are going to learn in this article involves combination of Futures and Options. 2. Sell/Write two ATM Puts. As you can see the risk is unlimited to both sides. Frankly I do not like any trade that has unlimited risk. This trade has risk on both sides. In my book its not a good trade. NOTE: If you have a job or business  taking any trade with unlimited risk is NOT recommended. Why? Because you cannot monitor the markets 9-3. If some bad news comes while you are in an important meeting, a lot of money can be lost. On top of that your broker will call you and the only thing you will tell him at that point is to take the stop loss. By the way at that point what else can you do? But if you were trading full time may be you would have taken a stop loss much earlier. Still I would rather not suggest unlimited risk strategies. The reward is not worth the risk. Stay away. There are better trades. Just search my blog. 🙂 Or other blogs. In my course the directional strategy is a beautiful combination of Futures and options but the hedge is such that there is no unlimited loss, in fact there is no need to take stop loss as the Max loss is so small that a trader can just leave the trade one full month to hit target. What are the chances that it will hit the target if you leave the trade till expiry? Well a lot. The traders view is that Nifty may be range-bound or will fall slightly from here till expiry on 30-Apr-2015. The trader plays the ratio put selling. Sells 1 lot of Nifty Future at 8855 and also Sells 2 lots of 8800 PE at 75. Note: In such trades where the risk is unlimited and you cannot stop yourself trading, its highly recommended that you trade in 1 or 2 lots only. If you take a big risk and if Nifty really falls (your view is right) but falls too much suddenly you will have to take a huge loss. On the other hand if Nifty rallies, you still take a loss. Now lets calculate the max profit and break even points. The trade makes great profit if the stock stays at around 8800 till expiry or expires exactly at 8800. Lets calculate the profits. Coming back. Nifty expires at 8800. Profit from Futures: 8855-8800 = 55 points. 55*25 = 1375. Both the Put options expire worthless. 75*2*25 = 3750. 14,000*3 = 42000 = (5125/42000)*100 = 12.2% in less than 15 days  amazing returns  but it comes with unlimited risk, so trade with caution. This is slightly difficult to calculate as two lots of options are sold. So the profits: ((75 * 25 ) + (75 * 25 )) = 3750. Now the trader can take this as max loss. 8855 + 150 = 9005. So 9005 is our break even at the upside after this the trade starts losing money. At 9005 the Future will lose: 8855  9005 = -150 * 25 = -3750. Since both options expire worthless and trader makes 3750 from the put options this trade will break even at 9005. If 9005-8800 = 205 points was our BE, it should be same on the downside as well. 8800  205 = 8595. This is our BE at the downside. At 8595 the Future will make: 8855 – 8595 = 260 * 25 = 6500. 8800  8595 = 205-75 = 130. So a loss of 130 points = -130*2*25 = 6500. So at the downside 8595 is our break even. Below that the trade starts losing money. Where to take a Stop Loss in Ratio Put Selling? We just discussed the break even points  if it is breached you should take a stop loss. So in the current scenario the trade is safe from 9005 to 8595. Almost 400 points movement. Which means approximately every one times out of 2 the trade will hit stop loss. Note that both 9005 and 8595 are Nifty Spot prices, not the Future price. Now tell me do you want to trade this? Note: You may rollover the trade when SL is hit, but whether you make a profit or loss will depend on time taken to hit breakeven and volatility. If volatility has dropped and too much time has been taken to hit BE, on the upper side the trade may be in profit. In that case why should you rollover? On the lower side volatility may not have dropped, in fact increased and since falls are swift, the trade may be in loss. In that case you may rollover. 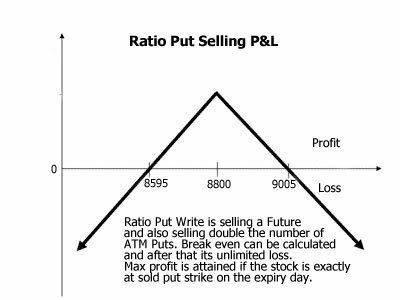 Ratio Put Selling involves One Future Sell and Two ATM Puts Sell. It has a unlimited risk and limited reward. Unlimited risk trades need your full attention. Please do not attempt if you have a job. Its important that you calculate the break even points and take stop loss when its breached. You may rollover the trade once SL is hit. There is no need to rollover if the trade is in profit when SL is hit. What do you do when you sell Future and its going against you? Do you hedge it or not? Please comment. Your questions and my answers will help other traders reading this. Superb explanation sir ….completely scientific. Thank You Nabin. Learn as much as you can, it will help. Dilip Sir I already stopped trading which involves unlimited risk. So No question about to trade this strategy. By the way Very informative article for traders who trade Futures with Option. I trade intraday and have all the time to trade. I understand you calculated at the expiry. Any way to overcome these expenses or cover ? There are many discount brokers in India who charge much less. I think SASonline.in charges only Rs. 9/- per TRADE. Yes per trade NOT lot. So you need only to bother about the STT when trading Futures. Just 3 points should be profitable. Congrats on starting with the New Domain Name!